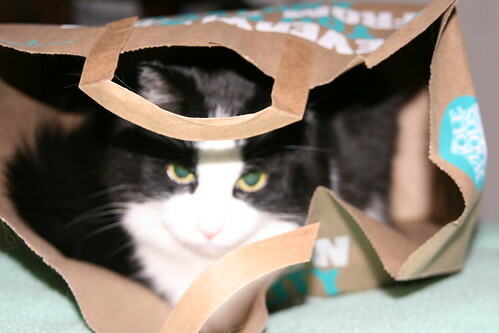 Arby is 14 years old and today, for the first time ever, he went inside a paper bag. He went in for about 30 seconds first, much too short for us to grab a photo. But a few minutes later, he went back inside and even laid down in it for a couple of minutes! 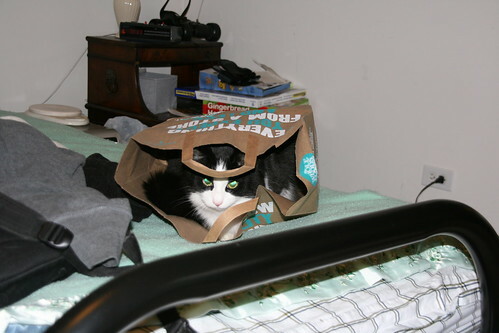 Arby and Alex both always seemed to be afraid of paper or plastic bags and they acted like they hated the crinkly sound they make. I know a lot of cats are attracted to these noises as so many popular cat toys feature a crinkly sound or crunchy texture. 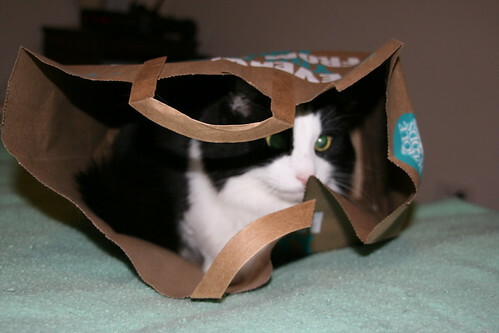 It was a Whole Foods bag. Our cute little Organic Arby. This entry was posted on Monday, January 19th, 2009 at 7:42 pm CET and is filed under Personal, Photos	with tags . You can follow any responses to this entry through the RSS 2.0 feed. You can leave a response, or trackback from your own site.